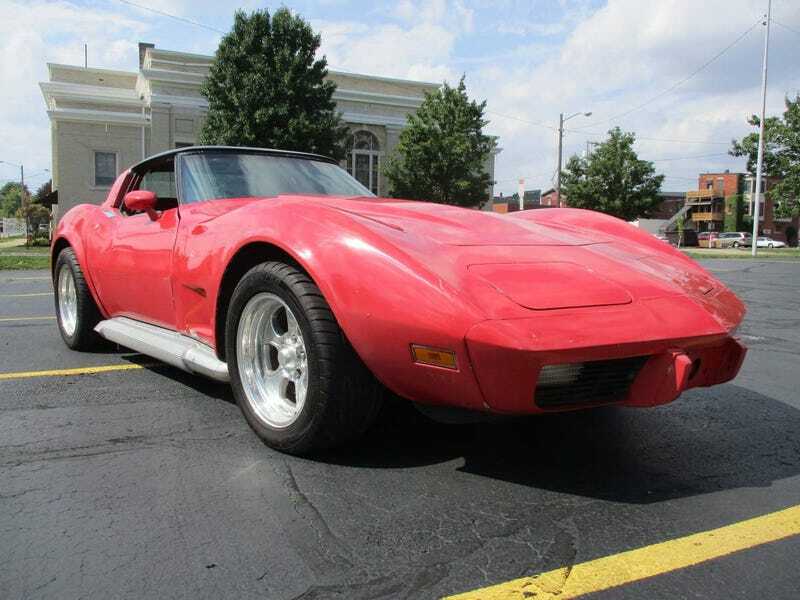 At $6,500, Would You Side With This Side Pipe-Sporting 1979 Chevy Corvette? You probably can’t afford a side chick or bro, but you could potentially swing the asking for today’s Nice Price or Crack Pipe Corvette which has something even better—side pipes! Let’s see if its price is on your side. Barbra Streisand, Jimmy Durante, and Rostand’s Cyrano de Bergerac are all notable for, among other things, their noses. Equally noticeable but far less popular was the nose… er, hood bulge on yesterday’s 1983 Porsche 944. That was necessitated by the carburetor and intake of the SBC currently in residence under the bodaciously bulbous hood. That bulge, and the car’s $9,500 price both proved too huge, the latter so much so that it earned itself a stinging 66 percent Crack Pipe loss. That’s too bad since the car otherwise did seem to be a hoot. If we’re none to keen on SBCs as invasive species, then let’s see how we like them in their natural habitat, something like this 1979 Chevy Corvette. Now, the C3 Corvette came in two distinct flavors: chrome bumper deliciousness and rubber bumper tasty but somewhat unfulfilling. That was driven by the model’s unfortunate position in having to bridge the free-wheeling ‘60s and the clamped down ‘80s. That era saw horsepower numbers drop as weight went up, which is pretty much the opposite of what you want a sports car to do. That being said, the C3 did see updates almost every year of its existence, and 1979 would prove to be the marque’s highest selling ever, with over 53,000 Corvettes rolling out of Bowling Green that model year. This one was pretty righteously equipped when first built, and it’s had some work done since to make it even better. The ’79 ‘Vette made standard the bubble back window and lightweight sports seats introduced on the 25th Anniversary car the previous year. This would also be the last year that a manual transmission would be offered with the high output L82 engine. This particular car has the Borg Warner 4 speed but the engine isn’t original. Instead it’s what’s described as a ‘rebuilt 350 with some performance options.’ The seller doesn’t say whether the gearbox behind that is an M20 close-ratio or M21 wide-ratio, but he does note that the car rocks a 3.55 gearset and posi in the rear-end. He also claims that it comes with the Fe7 Gymkana suspension. That included stronger springs and shocks up front, while out back a transverse 7-leaf spring and antiroll bar took up residence. The rest of the car looks like it’s seen some attention in places while less in others. The bodywork isn’t horrible, however the plastic bumper caps appear a bit rough and there’s paint chipping from the bubble back surround. Also, door gaps are wildly uneven indicating some sag or the need to fiddle with body panel placement. The car comes with the mirrored T-tops which was a factory option this year and side pipes which dump the exhaust out in front of the rear tires. Speaking of tires, those seem to have plenty of tread, and are wrapped around a set of aftermarket alloys. The less said about those the better. Inside things are red. Like, really red. The seats have been reupholstered, apparently at a bordello, and match the rest of the interior in their lurid hue. The steering wheel is also red, and has seen better days. An aftermarket head unit sits below the aircraft style center stack, and thankfully neither of those is red. Popping the hood shows an engine bay that’s a bit slapdash. There’s a missing breather on the left valve cover and the A/C is presently non-working. Perhaps most egregiously here, that ‘rebuilt’ 350 looks to have been painted Ford Blue rather than Chevy Orange. The horror! Rebuilt brakes on either side somewhat make up for that. The title is clean and the chassis is said to be solid and accident free. It’s indisputable that the later C3 Corvettes will eventually become extraordinarily dear like their predecessors, time and attrition will see to that. Right now however, they can be had on the cheap, and this one at $6,500 might just be a deal. That’s what we’re here to find out. What do you think about this non-numbers matching late C3 and that $6,500 asking? Would that put you into the unbelievably red driver’s seat? Or, is that still too much for a Corvette that once offered so little? Cleveland, OH Craigslist, or go here if the ad disappears. At $22,800, Might This Crazy Mixed Up 2002 Chevy Corvette Z06 Be A Straight Up Deal?